Our vulcanized fibre gaskets are manufactured to very high specifications and tolerances. Our gasket service includes custom cutting and prototype design. Vulcanized fibre is a laminated plastic composed of only cellulose. It is a tough, resilient, horn like material that is lighter than aluminium tougher than leather, and stiffer than most thermoplastics. A product very similar to vulcanized fibre is leatheroid, it is however made using a different chemical process. Elephantide press paper/board suitable for low voltage insulation. NOMEX410 which is a synthetic aromatic polyamide polymer that provides high levels of electrical, chemical and mechanical integrity over a wide range of temperatures. The polymer is made into floc (short fibers to provide mechanical strength) and fibrids (microscopic filmy particles serving as binder and filler), which are then combined together to form sheet structures by specialized paper & board making methods. This is densified using a calendaring operation at high temperatures and pressure to permanently lock the components together and produce a relatively impermeable structure with high levels of mechanical properties. It has chemical resistance to acids, alkalis, solvents & radiation, Compatible with industrially used oils, resins, adhesives, refrigerants accommodates most inks. It is resistant to insects, mould and fungi and causes no toxic reactions to humans or animals. It is self-extinguishing and does not support combustion. Does not drip or melt when heated or burned. VALOX FR-1 This is a FLAME RETARDANT POLYBUTYLENE TEREPHTHALATE film to UL94 VTM-0 has very high compressive and dielectric strengths, very low water absorption, excellent dimensional stability and good chemical resistance. Because it contains no plasticisers it does not become brittle with age under normal conditions. FORMEX® This is a FLAME RETARDANT POLYPROPYLENE film to UL94 V-0 has a high compressive and dielectric strengths, very low water absorption, excellent dimensional stability and good chemical resistance. 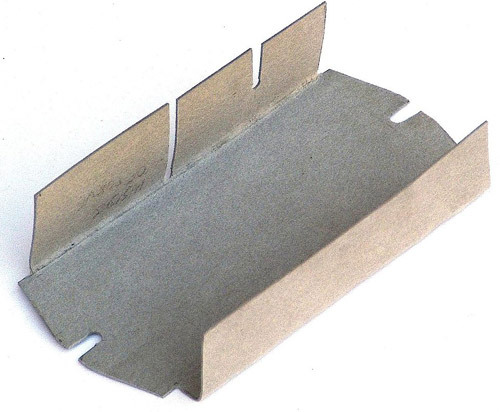 It has good cutting abilities and can be creased and formed to shape.